As the population ages and the world changes, retirement (as we know it) is rapidly becoming a thing of the past. If you are serious about planning for life after work, End of the Retirement Age is an inspirational guide to the challenges and opportunities of the new retirement landscape. Written to empower existing and soon-to-be retirees to take control of their futures - financially, socially and emotionally - End of the Retirement Age shares the inspiring stories of retirees and experts to show the colourful ways Australians are redefining ageing. ​There are many challenges you face as an existing or soon-to-be retiree. Discover what they are, why they’ve come about, and how you can tackle them head on. ​Discover how to navigate the ever-changing workplace, including how to find an age-friendly employer, and why social media could be the key to improving your job prospects. ​Discover how to achieve all of those bucket-list goals you haven’t had the time, money, or confidence to pursue. Funding a multi-decade retirement is no easy task. Learn the success principles required for a wealthier, worry-free retirement. If you’re ready to slow down, but not ready to retire, a transition to part-time, casual or consulting work can lead to higher levels of happiness, fulfilment and satisfaction in life. Hear real-life stories from Australians in their 50s, 60s and 70s who are already redefining retirement. From fundraising to skydiving to worldwide travel, you’ll gain inspiration and motivation to create your own unique retirement experience. ​Read about the four major challenges confronting retirees. Learn why it's time to reinvent retirement, with insights from industry experts. Access pearls of wisdom from recent retirees from all walks of life. Explore the economic opportunities of an ageing population. Discover how radical life extension technology may one day make living to 100 the new normal. David Kennedy is an author, consultant, and retirement planning specialist. He is the owner of Hillross Pacific Advisory, a Sydney-based retirement planning firm. 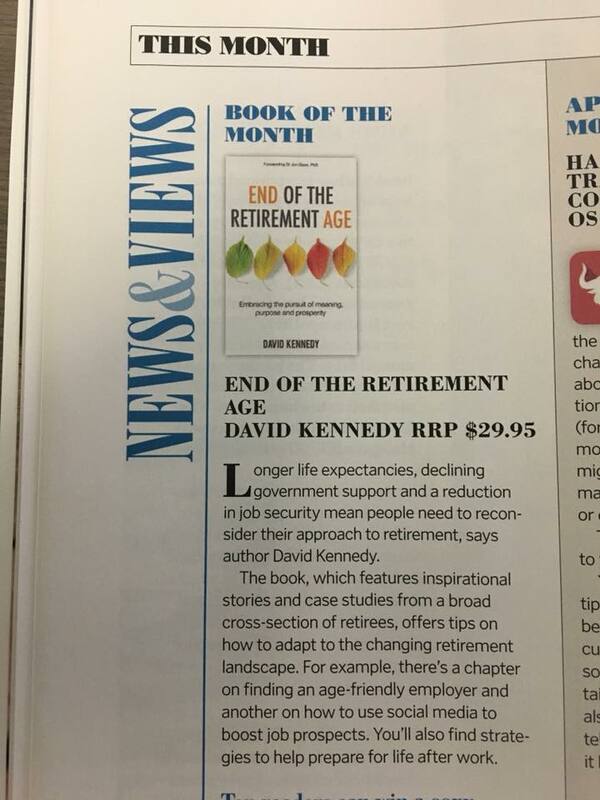 David has discussed End of the Retirement Age and the redefinition of retirement on ABC Radio Sydney, Sunrise, 3AW Radio Melbourne, and ﻿﻿6PR News Talk Perth. He also writes regularly for Starts at 60. His views on retirement planning issues have appeared in The Sydney Morning Herald, The Australian, Reader's Digest and ﻿﻿Financial Observer, while End of the Retirement Age featured as 'Book of the Month' in the December 2017/January 2018 issue of Money Magazine. David speaks regularly about the redefinition of retirement. He argues for the need to re-frame the conversation about the ageing population in positive terms, while placing greater value on the potential economic and social contribution of older Australians, who (on average), are healthier and living longer than at any point in history. "Many Australians in their 50s, 60s, and 70s are working longer, working flexibly, starting businesses, connecting online, travelling widely, getting active, fundraising, volunteering, and making a difference. This is a demographic that refuses to go quietly into retirement." An advocate for phased retirement, David encourages pre-retirees to consider a gradual transition from the workforce to the next phase of life. "Change tends to work best when it is allowed to occur over time, giving people a chance to adjust to their new reality. Retirement is no different. Taking a phased approach allows older Australians to tackle this major life-transition at their own pace." I﻿n writing End of ﻿the Retirement Age, David hopes to inspire, educate and empower soon-to-be and existing retirees to understand the rapidly changing retirement landscape, and to plan and prepare optimistically for this phase of life. Ready to reinvent your retirement? Order your copy of End of the Retirement Age today. © 2019 David Kennedy. David Kennedy (and Pacific Advisory Pty Ltd trading as Hillross Pacific Advisory) is an authorised representative and credit representative of Hillross Financial Services Limited ABN 77 003 323 055, Australian Financial Services Licence and Australian Credit Licence No 232705.